This is a very good introduction to Asp.net Ajax. In the beginning Dino explain what’s going on under the hood (partial page rendering, extenders, client logic, etc). After that he takes you on a quick tour of existing extenders (Ajax Control Toolkit). Finally he discover remote method calls to web services and page methods. Looks like it’s a good book to start working with ASP.NET AJAX. If you are new with this technology you definitely should buy this book. 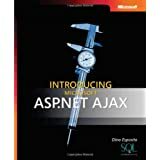 Even if you have an experience, read the first part of the book, it contains interesting under-the-hood details of the ASP.NET AJAX framework.